A vibrant palette that's true to the port of Cape Town, at the Southern tip of Africa. 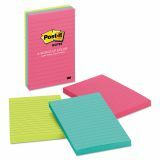 Post-it Notes Original Pads in Cape Town Colors, Lined, 4 x 6, 100-Sheet, 3/Pack - Post-it Notes are the perfect size for notes, numbers and lists. Re-positionable adhesive won't mark paper and other surfaces. Attach notes without staples, paper clips or tape. Use the self-adhesive top strip to stick them on papers, desks and other places where you need a reminder. Neon notes are lined for neater notes. Paper used comes from well-managed forests where trees are replanted. 100 sheets per pad.